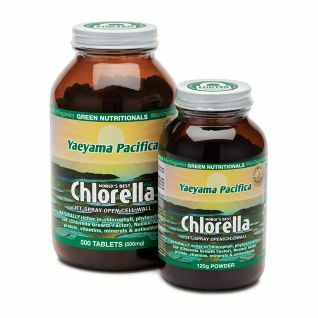 Selected over 40 years ago and grown continuously with a patented 'outdoor growing system', the Yaeyama Pacifica Chlorella strain is nutritionally superior, delivering higher levels of chlorophyll, Chlorella Grown Factor (CGF), protein, RNA, DNA and antioxidants, making it measurably the world's purest and most nutrient-rich Chlorella. Chlorella is a powerful detoxifying food, so when starting always take a smaller amount for the first week, with an adequate intake of pure water. It is possible some new users may not tolerate chlorella - in the event that you experience stomach upset or nausea when taking chlorella, either reduce the amount you are taking or stop taking chlorella completely and seek advice from your health care practitioner. If pregnant, breastfeeding or taking medications, always consult your health care practitioner before starting on Chlorella. If you have this sort of strong reaction, stop taking the product, it's not for you. If the vomiting is intense and prolonged, seek medical help to avoid dehydration. The most common use of Chlorella is as a nutritional supplement. As well as being rich in carotenoids and chlorophyll, Chlorella contains vitamin A, all the B's, C and E, and unlike synthetic forms found in multi-vitamin supplements – in their natural form, and without having to worry about dosage. Vitamins are however just the start, Chlorella is packed with minerals including potassium, zinc, magnesium, iron and calcium contains around 55% complete balanced protein. All this explains why Chlorella is THE No.1 selling health supplement in Japan. Unlike the nutrients found in synthetic vitamin preparations, the Vitamins and minerals in whole-foods such as Chlorella are bound to natural food complexes are readily recognised and absorbed by your body. It is now well accepted that it is beneficial to decrease our intake of acidic foods - such as meat, dairy and sugar, and increase our intake of alkalising foods such as leafy green vegetables, nuts, seeds & ..........Chlorella. At the heart of Chlorella's health benefits is its ability to naturally cleanse and detoxify. Firstly, the fibrous indigestible outer shell has been proven to bind with heavy metals and pesticides to facilitate removal from the body. This hard cell wall is not removed in Yaeyama Chlorella but 'opened' by Water-jet spray technology to enable assimilation of the nutrients within. This fibrous material supports healthy digestion though the promotion of peristalsis and the encouragement of good intestinal bacteria. Chlorella contains up to 5% chlorophyll, the largest amount in any plant. chlorophyll is a green pigment critical to photosynthesis allowing plants to create energy from sunlight. Chlorophyll is very similar to heme, the pigment in blood, only it has magnesium at its core not iron. This allows it to work at a molecular and cellular level binding to carcinogens in the organs and facilitating elimination. The tropical climate of Ishigaki Island, 1000 km. south of the mainland, is ideally suited to Chlorella cultivation. Clean air and fresh mountain spring water make for a complete absence of harmful contaminants. Chemical analysis shows Yaeyama Pacifica to have no detectable levels of mercury, lead, pesticide and herbicide. Unlike some Chlorella, Yaeyama Pacifica is grown outdoors in 45metre controlled ponds allowing the Chlorella full benefit of the strong tropical sunlight. Yaeyama Pacifica Chlorella undergoes a unique water Jet-Spray Cell Wall Technology developed by the grower, to gently open the cell wall for a high 82% digestibility, delivering potency, purity and mild taste. Where is the Chlorella grown? Micro-algae are very effective at mopping up contaminants such as heavy metals and pesticides, and some Chlorella is grown in regions where pollution is high. Can I see a full analysis? The biggest enemy of Chlorella is oxygen which can quickly damage the sensitive vitamins, enzymes and antioxidants, reducing nutritional potency. In the 1950's Chlorella (and later, spirulina) attracted the interest of scientists seeking food sources able to overcome the problems of drought and land scarcity. Chlorella, with its ability to produce 50 times the protein per hectare available from conventional crops, was top of the list. Due to its hard outer wall, there were initial concerns with the digestibility of Chlorella. These were addressed in the 1970's with the development of various cell wall breaking technologies. Since then, numerous studies have confirmed Chlorella's nutritional and health benefits and Chlorella today is recognised amongst the most nutritious and useful of the 'Green Superfoods'. Chlorella has been the most popular food supplement in Japan for over 20 years and has today an estimated 10 million users. With its outstanding healing, nutritional, detoxification and anti-inflammatory properties, Chlorella has outlived many health fads and continues to grow in popularity. Since the Fukishima disaster occurred, continuous independent testing on both Hawaiian Spirulina and Yaeyama Chlorella have shown NO detectable radiation.